Ever since antiquity, we've used diuretics to pee more. Some diuretics like caffeine are ubiquitous (think tea or soft drinks). However, it wasn't until the twentieth century that mankind realized the pharmacological potential of diuretics. In 1937, researchers discovered carbonic anhydrase diuretics. By 1957, researchers had discovered much more potent chlorothiazide diuretics. Diuretics work by increasing the volume of urine that you produce and altering your body's electrolyte or body salt compositions. Pretty simple concepts, huh? Nevertheless, the various biochemical mechanisms by which diuretics work are inimically difficult to understand. For example, the formation of urine involves concentration gradients, osmosis, transporters and so forth. In a general sense, diuretics work by ridding our body of excess fluid volume or "water." There are plenty of diseases which are assuaged by the release of fluid including hypertension, heart failure, brain swelling (edema), eye swelling (eye swelling) and swelling secondary to liver or kidney disease. Before learning how diuretics work, let's briefly go over the nephron and the anatomy of the renal tubules. 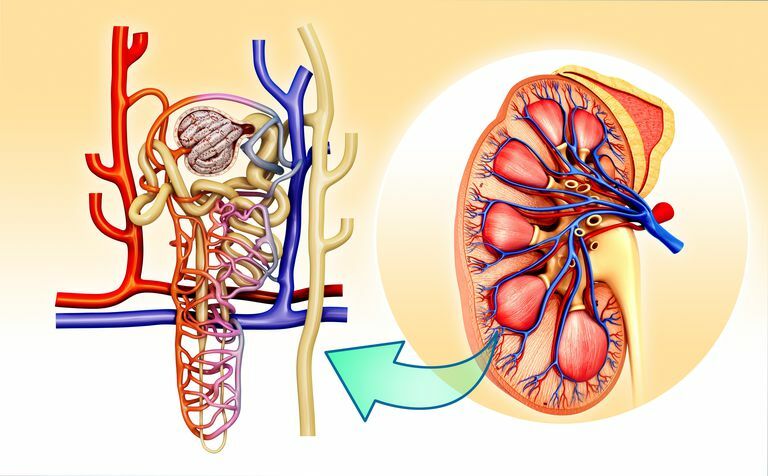 After all, diuretics work by action on the various parts of the nephron, the basic structural unit of the kidney which is responsible for filtering urine. Blood is brought from the body into the renal corpuscle which is composed of the glomerulus, a tuft of capillaries, and the Bowman's capsule. The renal corpuscle is the first step in urine filtration. The glomerulus hooks up into the renal tubules, a system of microscopic tubes responsible for making urine. The first part of the renal tubule is the proximal convoluted tubule. The proximal convoluted tubule feeds into the loop of Henle. The first part of the loop is descending limb and the second is the thick ascending limb. The ascending limb feeds into the distal convoluted tubule. The distal convoluted tubule hooks up to the collecting duct. Carbonic anhydrase inhibitors like acetazolamide work by inhibiting the enzyme carbonic anhydrase located in the proximal convoluted tubule. Typically, carbonic anhydrase is responsible for sucking sodium (NHE3 antiporter), potassium, water, amino acids and sugars back into your blood. By inhibiting this enzyme, drugs like acetazolamide increase the amount of water in the renal tubule system. Carbonic anhydrase inhibitors are mostly used to treat glaucoma. Loop diuretics like furosemide inhibit the Na/K/2Cl transporter in the thick ascending loop of Henle; thus, decreasing sodium and water reabsorption into your blood. Because loop diuretics also mess with potassium reabsorption, potassium wasting can occur. If potassium wasting is severe enough, hypokalemia can result. Most notably, hypokalemia can screw up the way your heart works Furosemide is used to treat hypertension (high blood pressure), fluid in the lungs (pulmonary edema), generalized swelling, hyperkalemia (dangerously high potassium levels) and hypercalcemia or high calcium levels (off-label use). Thiazides work by screwing with the Na/Cl transporter in the distal convoluted tubule. In addition to blocking the reuptake of sodium ions and water, thiazides also result in some potassium wasting. Thiazides are used as first-line treatment of hypertension; in fact, a famous study found that thiazides are more effective as first-line treatment of hypertension than ACE inhibitors. When glomerular filtration rate (a measure of kidney function) is very low, thiazides don't work that well. Of note, thiazides are often combined with loop diuretics for the synergistic effect. In addition to hypertension, thiazides are also used to treat calcium-containing kidney stones and diabetes insipidus (different from the much more common type 1 and type 2 diabetes mellitus). As their names suggest, potassium-sparing diuretics work by increasing urine volume without wasting potassium. Potassium-sparing like spironolactone or amiloride both act on the collecting tubules but employ different mechanisms of action. Spironolactone antagonizes aldosterone in a poorly understood fashion. Aldosterone is a steroid hormone produced by the adrenal cortex. By antagonizing the effects of aldosterone, potassium, sodium and water retention is reduced. Spironolactone is often used to counteract potassium-wasting caused by thiazide and loop diuretics. This drug is also administered after the heart attack or used to treat aldosteronism from any cause. Amiloride blocks sodium channels in the collecting tubule and thus blocks the reabsorption of water into your body. Like spironolactone, amiloride is often used to counteract potassium-wasting caused by other diuretics. Osmotic diuretics pass through your body intact. When an osmotic diuretic like mannitol gets into your renal tubules, they draw in water by means of osmosis. (Remember with osmosis, water follows high concentration solutes. Furthermore, osmotic diuretics in vasculature outside the kidney (think brain or eye) can also draw off water and reduce swelling. In addition to treating both eye swelling (glaucoma) and brain swelling (increased intracranial pressure), osmotic diuretics are also used to renal failure secondary to increased solute load resulting from chemotherapy or rhabdomyolysis (muscle breakdown). In other words, by diluting drugs and bits of muscle in the nephron, less stress is placed on the kidneys. Vasoreceptor antagonists or vaptans (conivaptan and tolvaptan) are a new class of drug. They work via antagonism of vasopressin or antidiuretic hormone and enable your body to secrete electrolyte-free water. As such, vaptans help with hyponatremic conditions defined by low sodium concentration in the blood like SIADH. Most of the diuretics discussed in this article are available by prescription. Nevertheless, you can buy some diuretics without a prescription. Even though merely increasing your urine volume and fiddling with your electrolyte levels may sound benign, when taken improperly, diuretics can cause dehydration and potentially lethal electrolyte imbalance (mess with your body salts). Diuretics can also exacerbate cirrhosis, heart failure, or renal failure. Please take diuretics only after consulting with your physician especially if you fluid balance issues. On a final note, if you're wondering about caffeine, research shows that when a healthy person drinks caffeinated beverages, loss of fluid is no more than the volume of the beverage consumed and hydration status isn't compromised. In other words, if you're healthy then caffeine is safe. Eaton DC, Pooler JP. Chapter 8. Regulation of Potassium Balance. In: Eaton DC, Pooler JP. eds. Vander's Renal Physiology, 8e. New York, NY: McGraw-Hill; 2013. Sam R, Pearce D, Ives HE. Diuretic Agents. In: Katzung BG, Trevor AJ. eds. Basic & Clinical Pharmacology, 13e. New York, NY: McGraw-Hill; 2015.